As I head into the final two months of the Southwest China part of this tour, life on the road is shifting. Seasons, climate, gears and landscapes change, and into the mountains we go. These last months of pedaling have been through a bright droning heat. I had to go south first for visa reasons, so that was the lot I drew: South China in the middle of summer. The first signs of a waning season came in Hanoi. I sat at the low outdoor seating of a cafe talking with members of the local 350 group (pictured above). The winds picked up and brought cool delta air through the city. We drank custardy egg coffee and tugged the conversation back and forth between politics and lighter social novelties. For some individuals, the difference is important. A group of us who had stopped to talk outside of Ho Chi Minh’s mausoleum were shooed away, told we couldn’t gather there on the sidewalk. Activism and any other work that the government perceives as threatening can carry jail sentences, and people are understandably hesitant to stick their necks out. Most rely on more benign ways of trying for a better future. They work in social enterprise, they go into schools to give lessons on the environment or they talk to their peers. For others the denial of activism seems semantic, a way to keep toeing the line. Protests are outlawed in Vietnam, but consequences depend on enforcement and enforcement on interpretation. So, what is a protest? If 3 or 4 people dress up like lumps of coal and dance around holding signs informing passersby about the health hazards of coal, is that a protest? Holding a funeral for coal (as many have already done in cities around the world) might offend the wrong people, but what about a baby shower for clean energy? How can you be protesting if all you’re doing is celebrating? 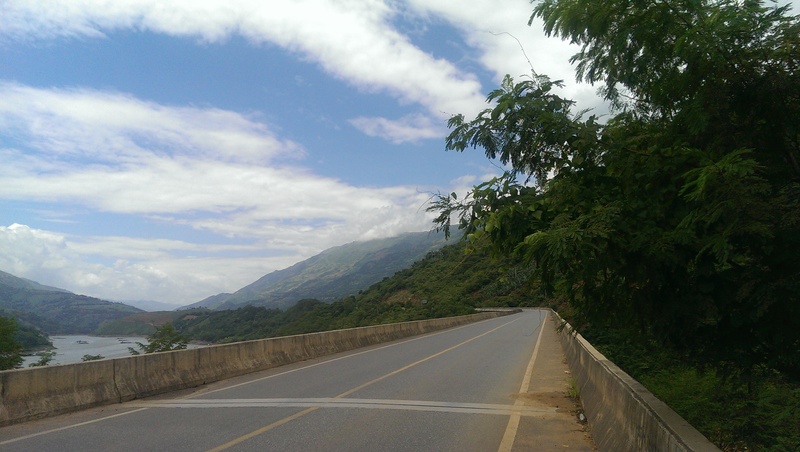 From Hanoi, I rode north through the hills and crossed the border back into China. Following the border up the gorge of the Hong (Red) River, I had my last few days of tropical heat before cutting into the hills. In the border town of Lao Cài, a beautiful, wild-looking urban garden lies not a 5 minute walk from downtown. Ain’t nothing quite like an open road under a Yunnan sky. Hong River on the left. The road heading up into the mountains climbed 1,700 m over a span of 30km. Pictured is the first few kilometers of the climb as it winds up the gorge. I climbed for hours through banks of clouds, barely able to see the road in front of me, but for this one brief moment I could see to the terraced valley below. I passed the summit in a chill rain, putting on my jacket for the first time since I started out nearly 3 months ago. As I descended into the valley though the sun came out and warm dry gusts came up from the fields. I took one last look back to the South and saw this double rainbow. Euphoria. I’m trying to work up a few more stories that I collected from environmental advocates and a social enterprise in Guangzhou, but know that for the next few months my posts may thin out considerably. I don’t know what the internet situation will be like and villages are few and far between up there so I may be camping anyway. Either way, I’ll come back with pictures and stories, and when I get to Chengdu there’ll be more to be said on climate and environmental work in this part of the world. Wow! 15,700+ ft elevation! I remember puffing at about 12,000 skiing in Colorado when I was your age. And steep! The relief section/ red ascents look so steep that I think you’ll have to rope up. No fooling, this looks like a formidable trek, not just for the physical effort, but for the need to camp out , and , I would think, the danger of losing control during descents, especially with your extra weight. Won’t you have to brake all the way down a lot of the way? Can you rely on the brakes you have? Please check them out every day. Best wishes. I should be fine, I’m going to replace my brake pads and wipe down my rims before I really start with the long descents. Luckily, there shouldn’t be too much rain involved there. If I feel a descent is too dangerous, I can always hitch hike downhill. Wouldn’t increase my carbon emissions, but it would be a pity after all that work!